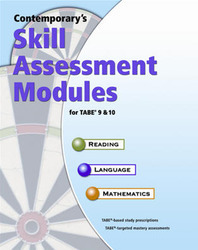 Skill Assessment Modules for TABE 9 & 10 is a complete software-based system to help improve student results on TABE 9 and 10. It combines the power of skill-based study plans with targeted skill-level tests to promote student NRS gain. The program's powerful management system provides the tools necessary to track student progress, customize student study plans, and determine TABE readiness. The complete set includes levels E, M, D and A.